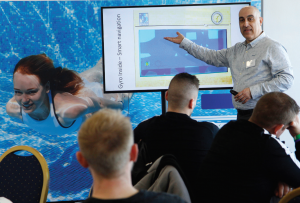 Bosta UK recently hosted the first product launch event for its new and exclusive Norsup product range. The event was held at Donington Park Race Circuit in their outstanding Pit Lane Suite which provided an ideal setting for the day, with 20 pool companies in attendance. A recurring theme each year with pool installers, who are not using the internet for sales, has been the need for product ranges that are not for general sale on the internet. Key priorities have included premium specification products that have unique advantages, extended warranty periods and promotional assistance. The Norsup product range aims to offer all these benefits and more. A dedicated dealer network that generates leads to its customers, loyalty scheme rewards and charitable contributions, courtesy of the Bosta Water Starters initiative. The Norsup range has been created for pool installers by pool installers. Offering a complete plant room set-up including Evo+ pool pumps, sand filters, Supernova UVs, Cyclone robotic pool cleaners and our Norsup inverter heat pumps. All the products have unique features such as the 100% German manufactured Evo+ pumps which are all fitted with premium Hanning motors. The Cyclone pool cleaners that have an extended cable length of 23 metres and WiFi control for all pool types. To further assist dealers, Bosta UK is offering the exclusive use of a live showroom demo set-up where customers can be shown the working products and understand their advantages with the backup of a range of promotional display materials.